Enmark has cut the ribbon on a new store in Springfield. Serving fresh food, frozen yogurt, made to order breakfast along with gas, diesel and car wash! 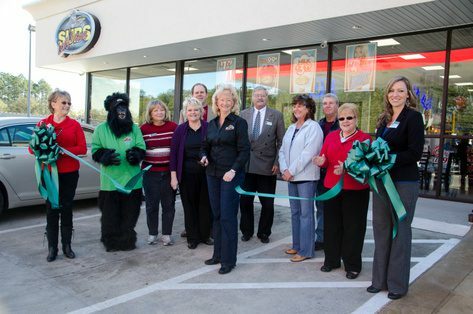 (SPRINGFIELD, GA) Enmark Stations, Inc. celebrates the grand opening of its newest location in Springfield, Ga., on Friday, January 18. The station, located at 1283 Highway 21 South, is the company’s first store in Springfield. Mayor Barton A. Alderman and several city council members are expected to be on hand for the ribbon cutting. The new Enmark station, located at the site of a former convenience store, has been fully remodeled and features eight gas pumps, two diesel fueling locations, fresh-brewed coffee and other standard convenience store items, along with six flavors of frozen yogurt and freshly prepared food including hot breakfast items, fried chicken, smoked ribs and rotisserie chickens. The station serves the needs of local residents, along with the thousands of commuters who travel up and down Highway 21 every day. “For the past 50 years, Enmark has made customer satisfaction our number one priority,” said Houstoun Demere, Enmark Stations, Inc.’s vice president. “We’re excited to continue that tradition with the store in Springfield and look forward to serving the needs of area residents and daily commuters."